It’s summertime – that usually means big, stupid movies on the Big Screen. We, however, have scoured local DVD clearance racks to try and find an intelligent contemporary film at a cheap price. Read on to find out if The Constant Gardener fits the bill. Defining The Constant Gardener is a tricky thing. It contains elements of a standard British spy thriller, corporate intrigue that might have been considered sci-fi decades ago, a dramatic love story, and lots of frantic editing during ambient “mood setting” location sequences. Of all the various threads in the film, the love story at the center is probably the strongest. The film follows British diplomat Justin Quayle (Ralph Fiennes) as he retraces his wife Tessa’s (Rachel Weisz) final days. He does so partly out of the fear that she was having an affair with one of several other men, and partly to finish the investigation she was working on. Tessa’s death may be linked to the unethical testing of a new drug on Kenyan civilians which has been subsequently covered-up. The film bounces back and forth in time, showing Justin retracing her steps and flashing back to the events that led up to her death. Justin has long wondered about the exact details of Tessa’s work, though he rarely brought it up to her, gardening away his worry. Thus the title. The thriller aspect of the film is interesting, but fails to be exciting in the ways that a full on genre picture might be. In fact, the thriller really doesn’t get started until 45 minutes into the movie. It’s fairly easy to see who the “good guys” and “bad guys” are from the beginning even if some of the individual plot points remain murky as the film concludes. The supporting cast is excellent with Danny Huston (Robin Hood), Bill Nighy (Hot Fuzz), and Pete Postlethwaite (The Town) rounding out the players. The film is well shot, and is rich in reds and blues. Director Fernando Meirelles frequently uses off center focal points and interesting fades to white. The film also uses “shaky cam,” though it isn’t detrimental to the film outside of a few frantic scenes. Despite the film’s good intentions, The Constant Gardener, like many social problem films, falls into the “White Savior” trap where White protagonists must save otherwise helpless People of Color. The Constant Gardener is based on a novel by British writer John le Carré, so it’s easy to see why the film focuses on British diplomats. However, among the many “arty” flourishes used by Meirelles, the film frequently includes random sequences of Kenyans doing “stuff” (riding bikes, putting on plays, living and dying) without any real impact on the story or the main characters. Few have names, none have back stories, and the largest plot twist involving a Kenyan is reveled through a conveniently available photograph. For a film that wants us to be outraged by the conditions in Africa, it is a shame that it does not hesitate to depict Kenyans as quintessential “others.” This could be the film showing Justin’s point of view, but even as he becomes more aware of the severity of problems in Kenya, most of his interactions remain with other Brits. On a purely pragmatic level, reining in some of the essentially ambient "Kenyan's doing stuff" segments might have helped the pace once Quayle begins investigating the pharmaceutical company. 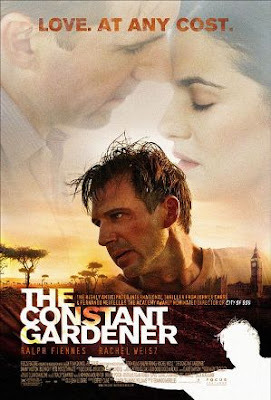 The love story at the center of The Constant Gardener is well-written, and the film is well acted and shot. However, the film's own “artiness” makes the thriller angle murkier and less exciting than it might have been. Furthermore, the film’s social concerns are muddled by not having any significant roles for Kenyan characters.